This old fashioned banana cream pie from scratch is so dreamy and creamy. Before cool whip and instant pudding, this is how a cream pie was made. If you leave out the bananas, you have homemade vanilla cream pie. If you add 1 cup shredded coconut to milk as it's being heated, you have coconut cream pie. That's how versatile this recipe is. In a large saucepan, scald the milk. Meanwhile, combine the flour, sugar and salt in another saucepan and add the scalded milk over medium heat. Cook until thickened whisking constantly. In a small bowl, beat the egg yolks and add 1/2 cup of the hot pudding mixture; whisking well. When combined, add this mixture to the remaining pudding in the saucepan. Cook for two minutes, whisking constantly until it is thick and bubbly. It's ready when the pudding coats the back of a spoon. Remove from the heat and fold in the butter and vanilla. Set aside until it's cooled a bit. Meanwhile, slice the bananas and line the bottom and sides of the graham cracker crust. Pour the pudding mixture over all. When cool, you can make a meringue topping or use this light and luscious homemade whipping cream topping. For the meringue, just put the egg whites and beat on medium until stiff. Add sugar and mix on high until meringue stands up on it's own. Spread over the top of the pie. You may brown it under the broiler, or just sprinkle the top with crushed graham crackers. Beat the heavy cream in a mixing bowl until soft mounds form. Gradually add sugar and whip until stiff peaks form. Chill until ready to top the pie. The recipe below is for my famous old fashioned banana cream pie. Enjoy. 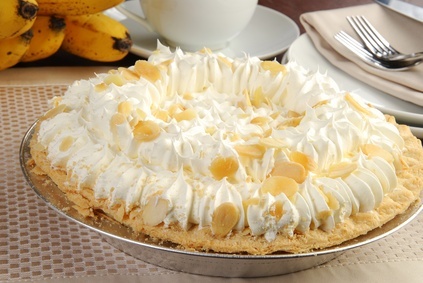 For years I made this old fashioned banana cream pie by filling my favorite crust with bananas, my best vanilla pastry cream and swirls of whipped cream - see above recipe. No so long ago, I made three tiny changes to my old fashioned banana cream pie recipe. First, I swapped the white sugar in the pastry cream for brown sugar. Then I added a smidgen of spice, and last I stirred sour cream into the topping - and this recipe went from great to out-of-this-world. 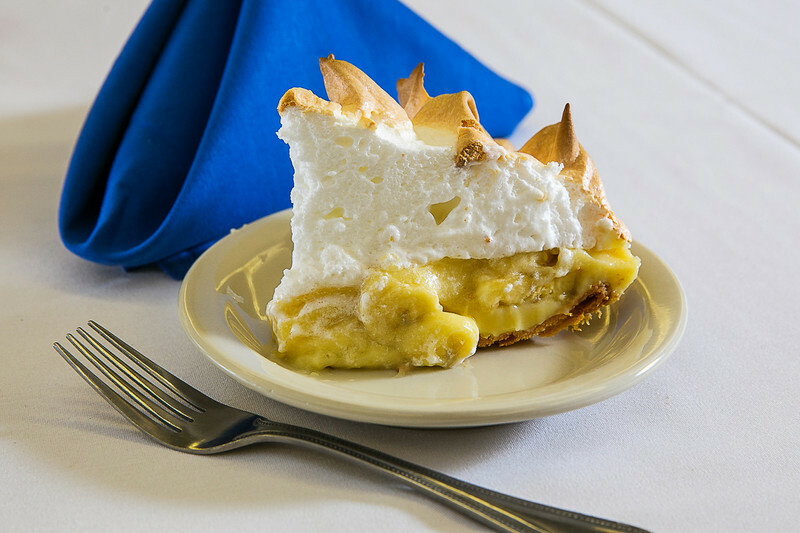 This old fashioned banana cream pie recipe literally is "to die for." Takes a while longer, but so worth the effort. Bring the milk to a boil. Meanwhile, in a heavy bottomed saucepan, whisk the yolks together with the brown sugar, cornstarch, cinnamon and salt until well blended and thick. Whisking continuously, drizzle in about 1/4 cup of the hot milk (this will temper - or warm the yolks so they don’t curdle), then add the remainder of the milk in a steady stream while whisking. Put the pan over medium heat and bring the mixture to a boil while whisking, for 2 minutes before removing from the heat. Whisk in the vanilla extract. Let stand for 5 minutes, then add in the bits of butter, stirring until they are fully incorporated and the custard is smooth and silky. You can either press a piece of plastic wrap against the surface of the custard to create an airtight seal and chill until cold OR to cool the custard quickly, put the bowl into a larger bowl filled with ice cubes and water and stir occasionally until the custard is thoroughly chilled, about 20 minutes. When you are ready to assemble the pie, peel the bananas and cut them on a shallow diagonal into 1/2 inch thick slices. Whisk the cold custard vigorously to loosen it, and spread about 1/4 of it over the pie crust - it will be a thin layer. Top with half of the banana slices. Repeat, adding a thin layer of pastry cream and then the bananas, then smoothing the rest of the pastry cream over the last layer of bananas. To make the topping, beat the cream until it just starts to thicken. Beat in the powdered sugar and vanilla and continue to beat until the cream holds firm peaks. Switch to a rubber spatula and gently fold in the sour cream. Spoon the whipped cream over the filling an spread evenly to the edges of the custard. Sprinkle with a few macadamia nuts. Serve, or refrigerate until needed.